Steve refuses to go to Open House night at school because he thinks his classmates will make fun of him for not having a dad. Steve is pleasantly surprised to find he is not alone. 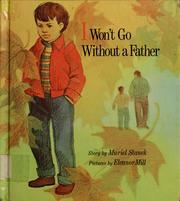 Stanek, Muriel, “I won't go without a father,” Children's Picture Book Database at Miami University, accessed April 24, 2019, https://dlp.lib.miamioh.edu/picturebook/items/show/6014.